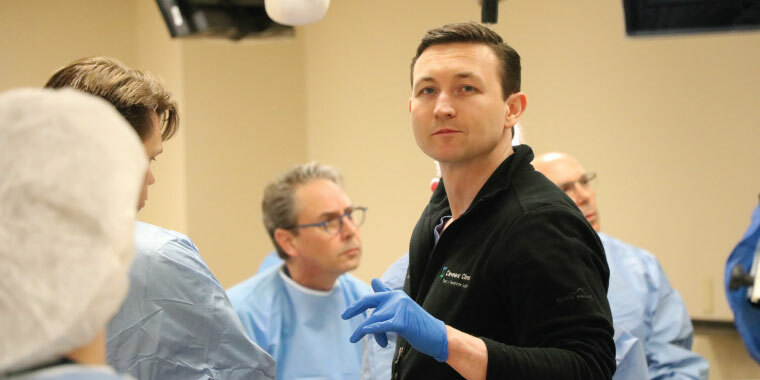 The annual Kansas City Facelift Symposium at Kansas City University (KCU) is an opportunity for anatomy fellows to work alongside faculty, residents and experienced surgeons while observing international experts in the field of plastic surgery demonstrate their skills. The most recent symposium was held on campus in April. James Zins, MD, a plastic surgeon with the Cleveland Clinic was the featured guest. Dr. Surek is a former KCU anatomy fellow who spent hours learning and practicing his skills in the anatomy lab. Now, he is a practicing plastic surgeon in the Kansas City area as well as an anatomy professor at KCU. Dr. Surek feels KCU’s anatomy lab is a perfect location for the symposium. “We can project the dissections on big screens, interact with everybody and have a productive learning experience for all,” he added. Dr. Surek hopes the annual event continues to grow and bring in more experts and physicians from around the country and the world.